I really do love the Vintaj line of brass jewelry findings! The dark color of the metal makes the finished pieces look so antique. As a garage sale and thrift shop hunter, I am not always lucky at finding old jewelry to recycle into new peieces, so the Vintaj line helps to provide lots of parts and inspiration. I think the antiqued brass goes well with so many beads and is much less expensive than sterling silver or goldfilled metal. The beads (except for the stick pearl) I used on this bracelet are from the Imagine It line of beads sold at Ben Franklin Crafts. 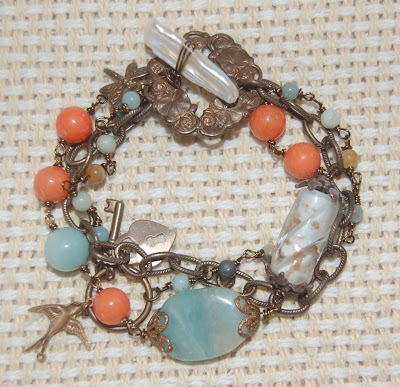 I will do my best to write up a project sheet for this bracelet and post it on our website (www.bfcraftclub.com) and/or make it available in the BFC Bead Shoppe. Perhaps I will even get around to making beads only kits (for the bracelet) and sell them at the BFC Hilo store or on our website store. I Gave Birth to Two Pumpkins! No, I didn't have twins. 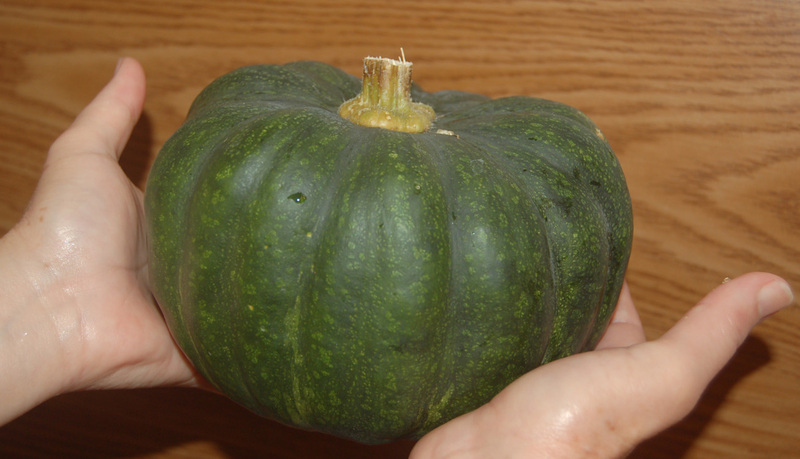 Two Kabocha pumpkins grew in our garden and I am so proud you would think they were my babies. Actually, I didn't have anything to do with the fact that they grew in our yard. 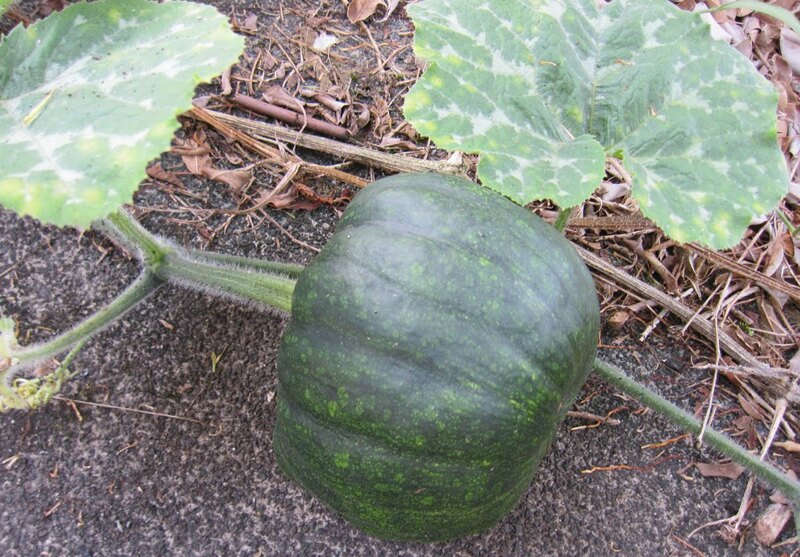 We have a compost pile and surprisingly the pumpkin vine just started growing there. It grew and grew for almost a year. The vine had lots of flowers but all the pumpkins fell off after they were marble-sized. Then one day we noticed two baseball-sized pumpkins. For many weeks we guarded the pumpkins and then we had to leave them to go to Washington D.C. so we picked one and left one on the vine. 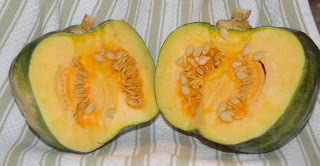 What is really amazing is that I usually microwave pumpkins (make holes in them first to avoid an explosion) before attemptng to cut them so the seeds are microwaved too. I can't believe that the microwaved seeds would sprout from the compost pile and be able to produce real pumpkins. Anyway, this is a long diversion from my usual posts but I hope it makes up for the lack of posts lately. As I mentioned, we were in D.C. where my son met President Obama at the Presidential Scholar gathering. They shook hands and he (Obama) gave a 'shaka ' wave. Here are a few more photos of the pumpkin from the vine to the pot. 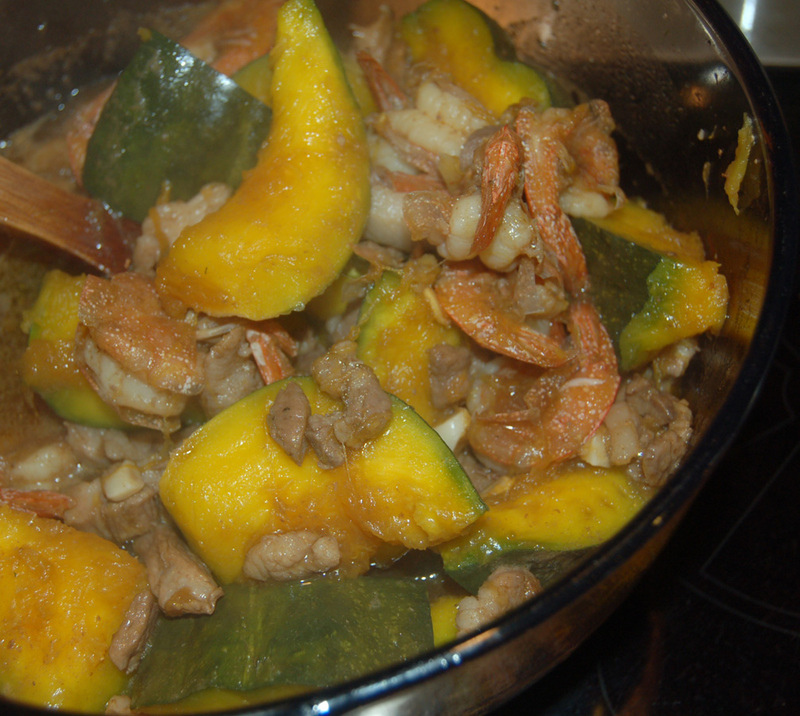 The pumpkin was delicious with chopped pork and shrimp. First I seasoned and fried the pork (1lb). Then I added some garlic, ginger, and shrimp (1 lb.). Next I added the cut-up microwaved pu mpkin and 3/4 cup shoyu, Splenda or Agave syrup (to taste), 1 T. red wine vinegar, and 2 cups water. Don't microwave the pumpkin for too long or it will be mushy in the final dish. You can use raspberry or Balsamic vinegar if you have them. Cook everything in a large covered pot on medium heat. Even if you don't have pumpkins growing from your compost pile, I hope you'll try and enjoy this simple dish. Here's another chipboard die cut project. I couldn't resist this Sizzix die because of the tea cup shape. 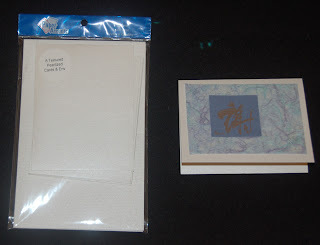 Again, (like the scallop-edged flap box) I used spray adhesive to glue the paper to the chipboard, but this time the paper (old K and Co. 12x12) was lighter colored and there were no creases visible on the finished project so I didn't have to think of a cover-up. Anyway, I really liked the finished look of this project and feel that it would make an excellent tea party favor filled with a few tea bags, biscotti cookies and fancy decorated sugar cubes. The rose is just paper cut with the Sizzix 3D rose die.....love, love, love this sweet die that can make two sizes of roses. 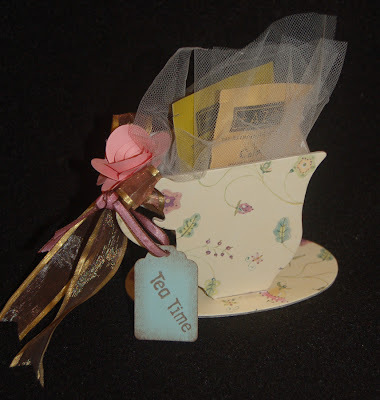 Now I'm thinking that it might be worth cleaning up my house just so I can have a tea party and make this for favors. LOL Maybe not.....my house is a mess......especially my craftroom! I COULD close the door. Would the door close?.....it hasn't in years! (One of my boys was surprised to recently learn that the room even has a closet....LOL!) Thanks for reading this post. I hope you found it enjoyable and will return to this blog site again. What is Vintaj? 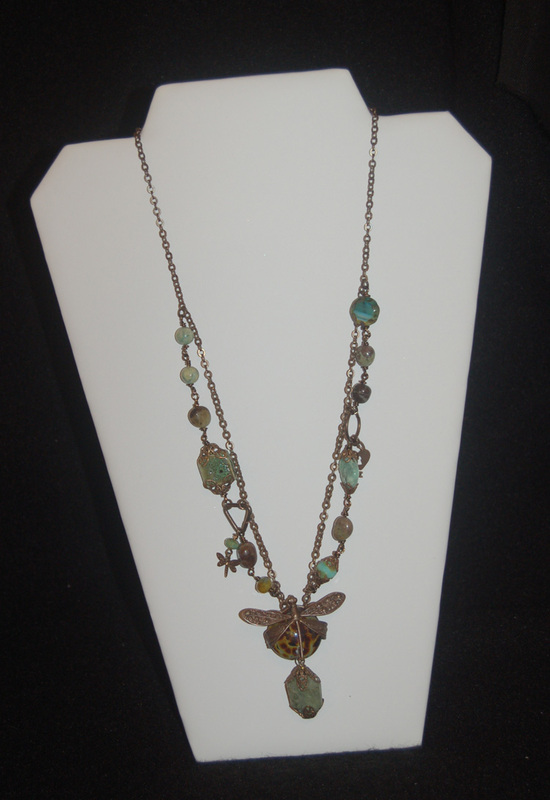 It is a line of antiqued brass jewelry components used to create the popular steampunk or vintage jewelry. Attractively packaged and priced, these Vintaj findings will be carried at the Hilo and Mapunapuna stores. Besides the warm chocolate color of the metal, I like the bendability and strength of the pieces. 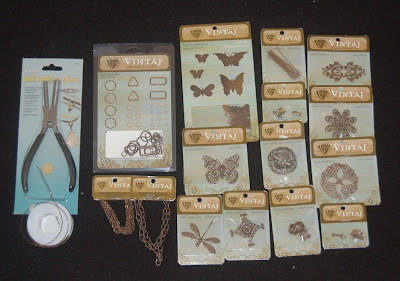 The Vintaj line also includes the useful non-tapering mandrel pliers, a letter punching set, wire, bead caps, charms, head pins, chains, and more. Using wire-wrapping techniques, I found it enjoyable and easy to fashion a one-of-a-kind wearable art piece. 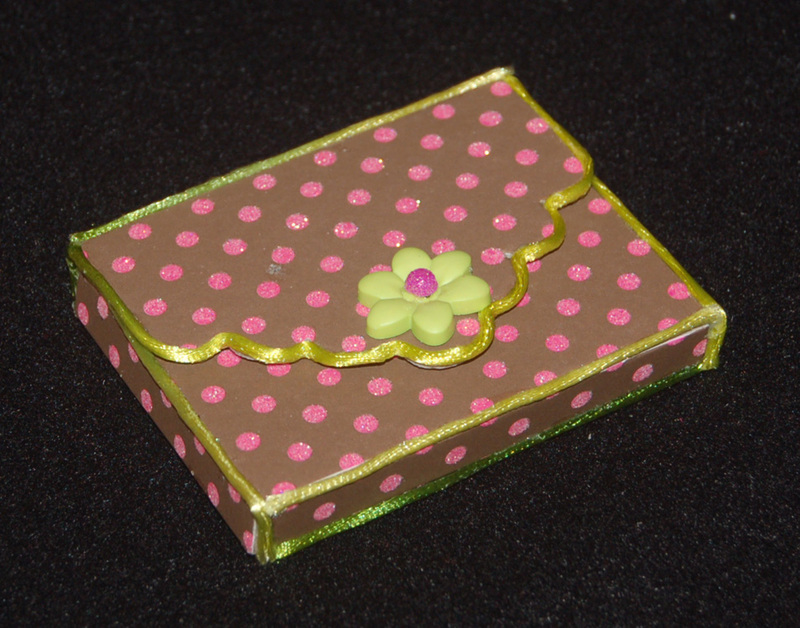 I will write up a project sheet and post it in our website craft project section (www.bfcraftclub.com) . Check out our website for other projects, sales, craft calendar schedules and coupons. dies capable of cutting through chipboard. The dies can be used with the extra long cutting pad on the regular Big Shot. However, the chipboards available are usually uncolored or white on one side. This makes for a rather boring die cut project. To make a more decorative paper project I attached scrapbooking paper to the chipboard with spray adhesive. Although this worked, there was still the unsightly crease/cut lines along the edges. I've been advised to color them in with markers but I thought that filling in the crease with something seemed like a better solution. I discovered thin cording (like the satin rattail cording used for lei-making) adhered with Fabri-Tac glue does a great job of covering the exposed chipboard innards. I was not able to keep this box together even with the red Tacky Tape so I used the Fabri-Tac for a secure seal. 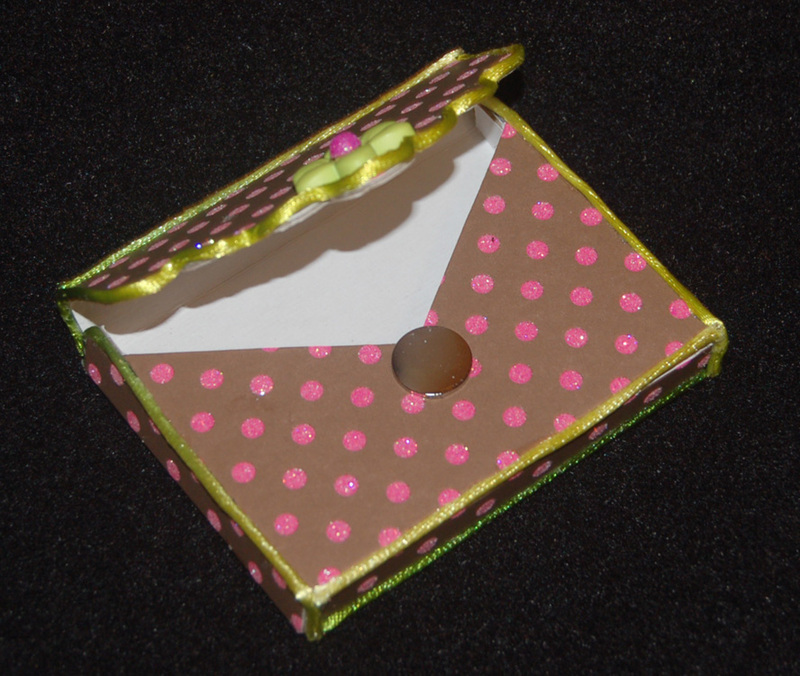 For this project I used variegated green cording, a flower button (embellished with a pink glittered dot sticker), and a magnetic button closure. This box would make a good reusable container for a gift card or could be used to carry around Post-It note tabs....great if you are doing research reading while traveling. When I first designed the bracelet attached to this heart-shaped box, I was partially influenced by the Imaginisce printed cardstock. The bracelet was featured in one of my February posts and uses a sterling heart chain, heart clasp, and beaded purse charm (available for purchase from our website store, www.bfcraftclub.com ). 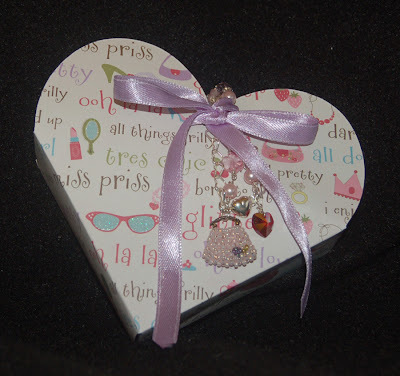 Anyway, I just purchased this Sizzix heart box die and thought that the Imaginisce design would work well. I noticed that the sample in the photo on the Sizzix die package had a charm attached. I immediately thought of the bracelet that I made and tied it onto the box with a ribbon. Having the gift (the bracelet) on the outside of the box made an appealing decoration and would make it intriguing to the recipient.......so what could be on the inside she will wonder. You could of course put cash or a gift card in the box but I was thinking that a new shade of lipstick, a scarf, or perhaps some perfume would be perfect. If you don't have one of the large die cutting machines, start saving up now because the variety of shapes you can cut seems to expand everyday. Some of the large size boxes can be cut in one piece, requiring just a few tabs to tape shut so you can easily form dozens or hundreds for a party. Usually the gift dictates the packaging, but with this heart shape you will have fun finding just the right gift to go inside this sweet box and that will make it a very memorable gift. Thanks for visiting this blog site. I hope you enjoyed reading today's post and that you will return often. Just a quick post to show you two new Paper Accent notecard with envelope packs being sold at Ben Franklin Crafts. The one on the left is a textured pearlized set and the one on the right is made from recycled birch. Both of them look great with washi paper. I just returned from Honolulu and so this will be it for today. 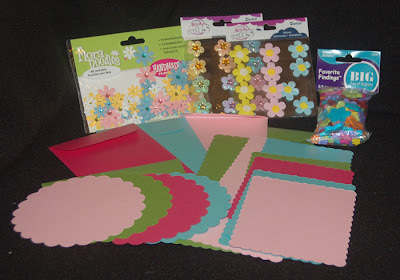 Tomorrow I get to play with my new paper goodies and beads .... yipee! Just a sample of some of the new items I picked up from Ben Franklin Crafts. The Paper Company pearlized scalloped papers with matching envelopes come in a wide range of sizes, shapes, and colors. 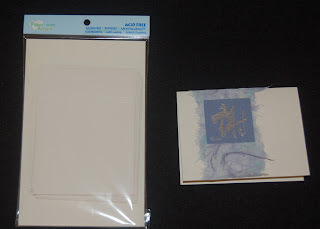 They are perfect to jazz up scrapbook pages or embellish as single-sided cards. Flowers are always popular for enhancing paper crafting and the ones shown here are only a few of the many available at BFC. I love the Darice puffy flowers (center packages) and I thought that the big bag of flower buttons from Blumenthal's is a bargain. Okay, time to make some pretty things with my newest craft treasures. As soon as I saw this dress box die, I knew that I had to purchase it. It is such a unique shape and would be perfect for bridal shower favors, princess parties, proms, or even wedding favors. The die is one of the large ones that uses a 12x12 cardstock and a crease pad. 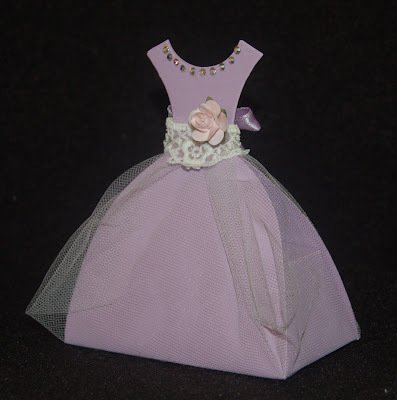 The dress shapes (front and back) can be cut apart and used as tags or decorations for cards. I used the photo on the package for inspiration. Tuile netting and lace were taped on to the box with Merikan double stick tape. The paper rose is from a bag of multi-colored flowers that I found in the Ben Franklin Crafts wedding aisle. I used Jolee's crystals and heat tool to decorate the neckline of the dress. This product makes the work effortless and so much neater than using glue. Although not fully shown in my photo there is a lavender satin bow in the back of the box. Thank you for stopping by today and I hope that you'll visit this site again. Please leave a comment if you have the time. Now that my son's graduation is history, it's time for him to write thank you notes. Usually when he has lots to write I just give him a box of store bought cards. However, I was in the mood to make some handmade cards. I was cleaning up my washi paper stash and came upon some sheets with a bit of foxing (reddish spots) but with usuable areas. Since my son's school colors are white, blue, and silver, I tried to use these colors on the thank you cards. I was also reorganizing my Asian rubber stamps and thought that the 'thank you ' character was very artistic. Keeping it simple I just silver embossed the design on blue paper and punched out the square. I am pleased with the simplicity of the design and that I made use of stuff I had forgotten about. Finding craft supplies hidden away is like discovering gold! It makes cleaning up fun. Happy treasure hunting!